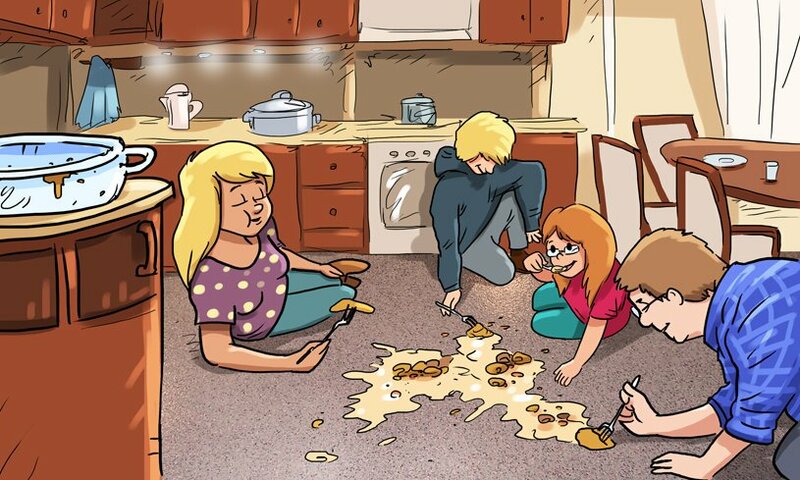 Marshall Jefferson almost spoils family dinner—Everlast® Epoxy hygienic antimicrobial flooring system saves the day! The Jeffersons’ famous tuna casserole had been a secret family recipe for ages. With each passing generation, each Jefferson child marked the beginning of their journey into adulthood by being selected for the honor of learning the secret recipe and cooking the casserole. Today, it was Marshall Jefferson’s turn. His parents, Mr. and Mrs. Jefferson, were proud and excited, as was his younger sister Sophie. After Marshall carefully prepared the casserole and placed it in the oven, he and the others played card games nearby, taking in the delicious aromas in anticipation of what they hoped would be yet another successful passing of the culinary torch. Finally, it was ready—time to eat! But after Marshall carefully removed the dish from the oven, with both hands protected by vinyl-padded mitts, something went very wrong: In his excitement, he tripped over Buck, the family’s cat. That’s when the entire casserole went flying out of the pan, and crashed onto the floor like an incoming tide. Marshall was mortified. Sophie started to cry. Mr. and Mrs. Jefferson tried to comfort their kids, but to no avail. Finally, everyone fell silent, standing over the ruined dinner. “But I just cleaned it this morning,” said Sophie. “Everlast Floor can handle extreme heat, honey. No problem there,” Mr. Jefferson replied. No matter what objection Mrs. Jefferson threw out, the answer was always the same: this is Everlast Floor, it can take it! One by one, the family moved to the floor. One by one, they scooped up a forkful of casserole. And together, they agreed it was one of the best they’d ever tasted. When they were done, they all pitched in for the cleanup. It was incredibly easy! No scrubbing or harsh chemicals required…just a little soap and water and it was as though the casserole had never taken a tumble in the first place. And damage? Not a trace. Everlast Floor held up like a champ, even though the casserole was piping hot on first impact. Are we endorsing people eating off our floors? Of course not. We’re just saying that with the proper care and maintenance, you could. If you wanted. Call Everlast Epoxy at (800) 708-9870 or click here to get your Everlast Epoxy hygienic antimicrobial flooring system. The only Jefferson who didn’t thoroughly enjoy the casserole incident was Buck the cat—the cleanup was so thorough that there wasn’t a trace of it left for him to eat off the floor!